Stoptrans med is a medical device designed for symptomatic treatment of acute and chronic diarrhea in children (including new-borns) and adults. Adsorbs and entraps toxins, viruses, bacteria favouring the elimination of pathogens that cause diarrhea. Prevents water and electrolytes loss. Diosmectite, glucose monohydrate, sodium saccharin, orange flavour, vanilla flavour. Each sachet contains 3 g of diosmectite. Symptomatic treatment of acute and chronic diarrhea in children (including new-borns) and adults. - Consult your physician if the symptoms do not improve within 3 days of treatment. - Consult your physician if the diarrhea is associated with fever, nausea or vomiting. - Suspend the content of the sachet right before administration in 50-100 ml of water. Take it preferably between meals. For new-borns, mix the content of the sachet in a baby-bottle with 50 ml of water or with semi-liquid food: fruit compote, mashed vegetables, baby food, and soup. The resulted mixture can be administered all at once or gradually along the day. Stoptrans med can be administered during pregnancy or lactation only on medical advice. -if you have fructose intolerance, glucose-galactose malabsorption or sucrase-isomaltase insufficiency (rare hereditary illness) due to the presence of glucose. 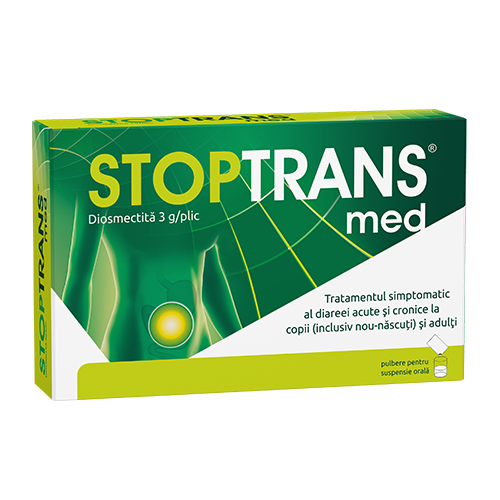 Stoptrans med must be used with precaution by patients with a history of severe constipation or diabetes mellitus (each sachet contains 0.979 g of glucose monohydrate). In children, the treatment of acute diarrhea must be accompanied by the early administration of an oral rehydration solution, to avoid dehydration. - eating grilled meats and rice. Diosmectite may interfere with the absorption of other drugs due to its adsorptive properties. It is recommanded that Stoptrans med should be administered at least 2 hours apart from other drugs. For other information ask for physician or pharmacist advice. Each box contains 10 envelopes and instructions for use. Stoptrans med is a Class IIa medical device in accordance with the European Directive 93/42 / EEC.